T&D are a stockist and distributor for all leading heat tracing cable manufacturers. 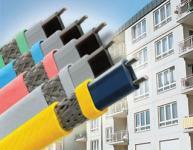 We also offer own-brand Heatfast range of cables and accessories. Heat tracing cables and systems provide guaranteed defence against cold weather effects (frost protection) as part of Winterisation plans and also precise process temperature maintenance for pipework. Pictured : Heat Tracing Cables Manufactured By Thermon : Designed to prevent pipe contents from freezing, Thermon heat tracing cables are installed to pipework for Winterisation (freeze or frost protection) and tracing process pipework for temperature maintenance. T&D are hazardous area experts - we supply Hazardous Area Heat Tracing Cables & Systems to comply with a range of national and international directives including ATEX, IECEx, UL, CSA, INMETRO, GOST-R, GOST-K.